This spicy ‘carb free’ dish is super on its own, as part of a curry feast or as a side dish. Place the cumin, coriander, fennel, mustard seeds in a dry pan and toast until they start to pop, and allow to cool. Meanwhile peel the garlic and ginger. Once the spices are cool, place in a blender and pulse until smooth. (I find having a small coffee grinder helpful for this job). Heat 3tbsp of the oil, add the turmeric and cook for a few minutes then add the ground spices. Grate the garlic and ginger, chop the coriander and the chilli, salt and place into the oil with the spices and continue to cook for a few minutes. Add the lemon juice and the remaining tbsp of oil. 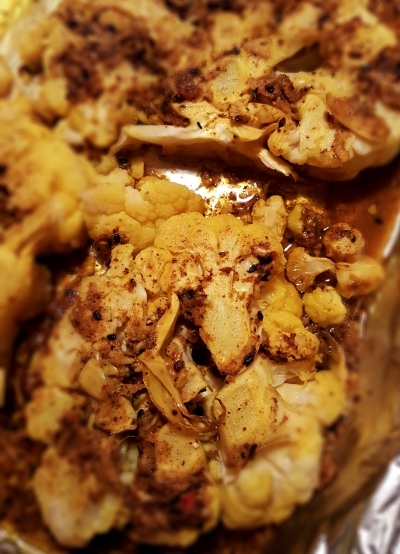 Remove the leaves from the cauliflower and the bulb at the bottom and cut it into four steaks about 15mm thick. Place a piece of greaseproof paper on a tray.